Bryan Fuller recently spoke with MTV News about what fans could expect from the new show he’s helming for the franchise, whose title was revealed today as Star Trek: Discovery. As a former writer for Deep Space Nine and Voyager, Fuller indicated he’ll follow those series’ lead and venture into more serialized storytelling. “We are telling the story in a modern way, which allows us not to try to wrap up the tale in 42 minutes. So we look at each season as one novel,” the showrunner said. And at today’s Star Trek 50th anniversary panel at Comic-Con, Fuller reiterated his position, telling fans and panelists that the first season’s story will be told in chapters. Fuller moderated the panel on Saturday afternoon, where he was joined by William Shatner, Brent Spiner, Jeri Ryan, Michael Dorn, and Scott Bakula. 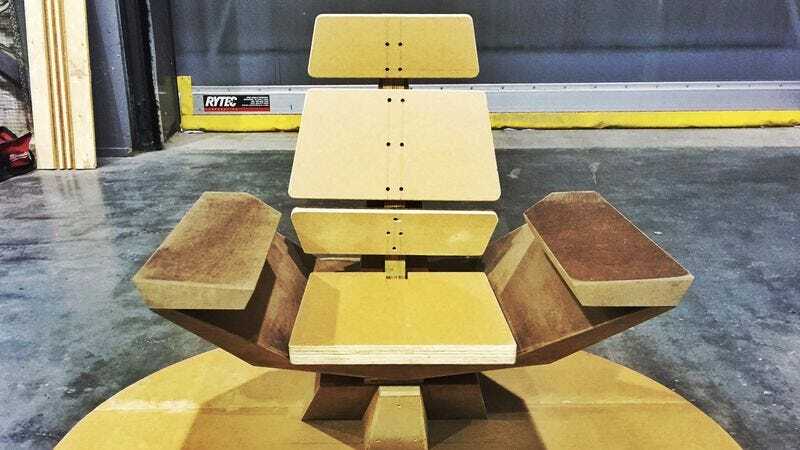 But the producer couldn’t really contain his excitement, and teased the reveal of details of his Star Trek series by tweeting a picture of the new captain’s chair, which looks more suited to a ship than a starship. Fuller also handed out doughnuts to the legions of fans waiting to get into the panel. A lot of the discussion centered on progression in storytelling, and how the new series should reflect societal progress as well as push it even further. Although his series is separate from the films—hooray for the Prime timeline!—Fuller’s tuned into the conversation for greater representation, which recently gained a lot of traction when it was revealed that Hikaru Sulu is gay.